In 2015, the Centers for Medicare & Medicaid Services (CMS) worked with the Outreach, Communication and Training (OCT) team to draft a series of data entry guidelines on the CROWNWeb system. This document, known as the CROWNWeb Data Management Guidelines, provided system users with a list of tasks and associated deadlines related to Data Monitoring, Data Quality Measuring and Data Quality Managing. 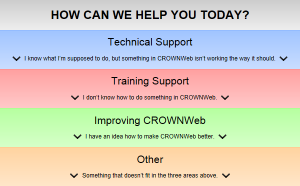 As the CROWNWeb platform has evolved and expanded to now include additional systems, there is a strong need for an updated version of this document. Recognizing this, CMS, OCT, and the ESRD Networks, Programs, and Data Managers worked together to create a new document encompassing all system updates and requirements. This new document is known as the ESRD Systems Data Management Guidelines, and it includes updates for the ESRD Quality Reporting System (EQRS) and updated language for the ESRD Quality Incentive Program (QIP). 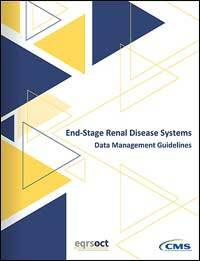 The new ESRD Systems Data Management Guidelines document was the focus of the March Town Hall. During this event, attendees were provided a high-level overview of each section of the document, including the purpose behind the document, the types of system users and their respective Data Managing Tier within the system(s), and how the each of the Data Managing Tiers work together. Attendees also received a first-hand look on each section of the guidelines (Data Monitoring, Data Measuring, and Data Managing), including all correlated tasks. These specific tasks were broken down by respective key points, frequency, and included a “how-to” link for step-by-step instructions. Additionally, system screenshots were presented to provide attendees with a comprehensive system overview. At the conclusion of the event, the OCT team presented a summary of the printable appendixes for the ESRD Systems Data Management Guidelines. The March Town Hall recording will be available for viewing within the next week via the Events page at www.mycrownweb.org. Need help locating the new ESRD Systems Data Management Guidelines? The ESRD Systems Data Management Guidelines, featuring a distinctive new look, can be found on the Home Page of www.MyCROWNWeb.org, as well as in the newly-updated CROWNWeb Training Materials and Documents page on the site. As each facility continues to work with their respective ESRD Networks to finalize the CMS-2744 Annual Facility Survey, the OCT would like to remind everyone that the one-hour training sessions provided to attendees in February is still accessible. Both the recording and downloadable PDF with step-by-step instructions on the entire CMS-2744 completion process are available from the Training Videos section on the Education page at www.MyCROWNWeb.org. Additional step-by-step instructions can be found in the Help File located on the Help menu. Clinical closure dates apply to all Collection Types (Hemodialysis; Peritoneal Dialysis). Additionally, clinical data submissions apply to all submission methods. The information included as part of this newsletter is current as of the date of release.